Every fashion statement begins with a sketch… Are you ready to make yours? 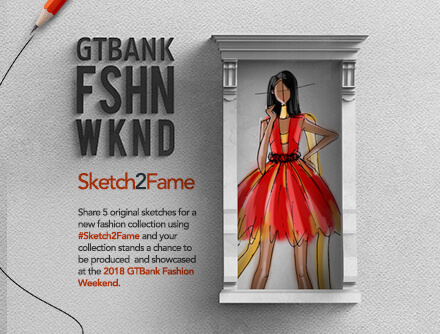 With the Sketch to Fame Challenge, we want to turn your sketches into fashion masterpieces. The African fashion industry is filled with incredible talents and at the 2018 GTBank Fashion Weekend, we are putting Africa’s Finest design talents on the global stage. Through our Sketch to Fame Challenge, we want to inspire the next generation of African designers and turn the ideas that they sketch on paper into brilliant outfits that will help grow their brands. What is the project selection process? Stage 2: A team of judges would shortlist the most original and innovative collection for the next stage. Stage 3: Shortlisted projects will be contacted. The selection criteria will focus on the creativity and originality of the collection as well as the feasibility of executing collection. If my collection is chosen, when will I be informed? Successful applicants will be informed via GTBank Facebook, Twitter and Instagram handles. The Sketch to Fame challenge is open to all across Africa only. Applicants uploads image(s) on their social media handle with the Hashtag #Sketch2Fame– social media channels for the challenge are Facebook, Twitter and Instagram. Applicant must be following @GTBank on Instagram, Facebook and Twitter in order to qualify for the challenge. Submission(s) must not claim GTBank endorsement. Each submission must be original, the work of the participant, and must not infringe, misappropriate, or otherwise violate any intellectual property rights, privacy rights, or any other rights of any person or entity. It is an express condition of submission and eligibility that each participant warrants and represents that the participant’s submission is solely owned by the participant, that the submission is wholly original with the participant, and that no other party has any ownership rights or ownership interest in the submission. Submissions will not be accepted if they contain any matter that, in the sole discretion of GTBank, is indecent, obscene, defamatory, libelous, in bad taste, or demonstrates a lack of respect for public morals or conduct. If GTBank, or the Judges, in their discretion, find any submission to be unacceptable, then such submission shall be deemed disqualified. Participants agree to leave any videos/images they reference for this Challenge on the internet and available to the public until the end of the Submission Period. Each participant represents and warrants that the participant is the sole author and copyright owner of the submission; that the submission is an original work of the participant and that the participant has acquired sufficient rights to use and to authorize others, including DOE, to use the submission, as specified throughout the Official Rules, that the submission does not infringe upon any copyright or upon any other third party rights of which the participant is aware; and that the submission is free of malware. 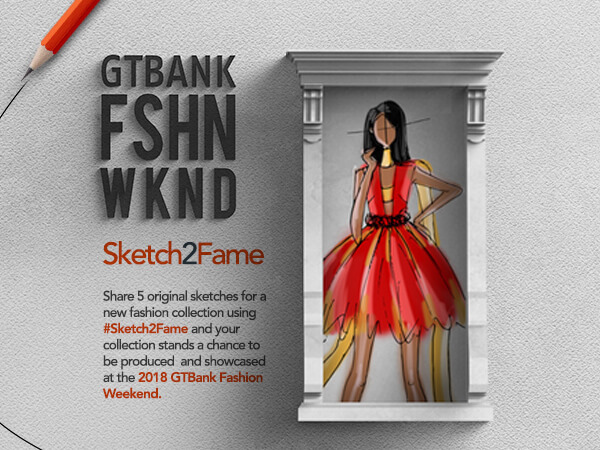 The Sketch2Famechallenge commences on September 12, 2018. After several phases encompassing submission of entries and voting (see full description below), it will end with announcement of final winners. Winners and runner-ups will be announced on October 5, 2018 on all GTBank social media handles including Facebook, Twitter and Instagram. GTBank shall have the right, at its sole discretion and at any time, to change or modify these terms and conditions. GTBank reserves the right to change, cancel or suspend this event at any time.